All our R/C products are designed and built to exacting standards of quality and reliability. This fact will be music to your ears if you're frustrated with the "cheap and nasty" products which are all too abundant in the world of R/C models. The quality and reliability of our products is perfectly demonstrated by the extremely few warranty returns that we receive -- all of our R/C products get less than one-twentieth (5%) of the industry average rate of warranty returns... which, looked at another way, indicates that Dawnmist R/C products are typically at least 20 times more reliable than the industry average. Furthermore, now that so many products include microprocessors -- and therefore also software -- the quality of this embedded software is critical, and many R/C modellers have had bad experiences with software 'bugs' in some companies' products; we at Dawnmist have more than 30 years of professional software engineering experience, and none of our R/C products has ever had a software 'bug' reported! As well as quality and dependability, our products give top-notch performance -- for example, our Electronic Speed Controllers (ESCs) are renowned for their smooth control, excellent torque even at low speed, and unrivalled energy-efficiency. Safety and proper fail-safe behaviour are also vital parts of our design philosophy. All our products are designed and manufactured in the UK using top-quality materials -- for example, all our Printed Circuit Boards (PCBs) are made from virtually unbreakable military-grade GRP material, whereas many competitors' products use cheap and fragile SRBP, which can easily develop cracks (and hence faulty operation, often intermittent in nature, which makes diagnosis very difficult) under the vibrations and shocks common in R/C model applications. All our product design is performed in-house, here in the UK; we do not subcontract any design work. This allows us to rigorously apply our philosophy of design excellence, and also means we offer unrivalled technical support for our products: Dawnmist is probably the only company in the industry where you can actually contact the engineer who designed the product and/or wrote its software if you need detailed technical advice or help! All in all, you can buy our R/C products in total confidence that you are getting industry-leading quality, reliability, performance and support. To help you make an informed choice about our products, this web page includes full PDF copies of all our products' User Manuals for you to browse or download... so you can find out all about our products before you buy. And if you have any queries not covered on this webpage or in the PDF manuals, simply get in touch with our dedicated technical support line: tech@dawnmist.org..
Dawnmist R/C Products are available directly from us, or from selected model shops and dealers. Dealer Enquiries are Welcome from model trade distributors/retailers -- please contact us for details. All Dawnmist Electronic Products are designed and made in Great Britain... and are used by modellers Worldwide! Best of British Quality -- Dawnmist Studio is an approved supplier of electronics to Britain's Army and Air Force. ESC and RevESC Electronic Speed Controllers State-of-the-art DC motor control! 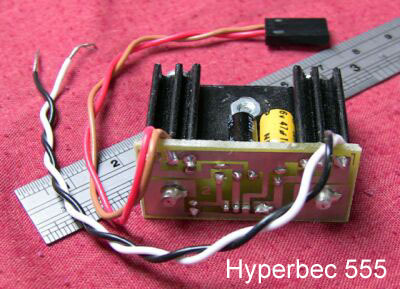 HyperBEC: High-power Battery Eliminator Circuit Say Goodbye to BEC problems! Lithimon: The Lithium Battery Problem Solver Our best-selling R/C product! UltiMix: Add Computer-R/C functions to a basic R/C! A 'must-have' for every R/C model! Throttle Minder: The Easy-to-Use Failsafe! Simple, economical anti-crash solution! ReverSafe Servo Reverser with Failsafe Instant cure for that 'wrong way round' servo! This brochure describes Dawnmist Studio's range of Electronic Speed Controllers (ESCs) for DC motors, a range covering 20 to 50 Amps at up to 30 Volts, giving a maximum power of a stunning 1500 Watts, with built-in failsafe and start-up interlock. The ESCs use technology developed for multi-Gigahertz computers to achieve unprecedented efficiency levels of over 99.5%, allowing the units to be small and run cool. All this is available at a very competitive price. All our speed controllers are also available configured for non-radio-control applications: the "VR" option (at no extra cost) specifies that, in place of the usual data lead and receiver (Rx) plug, a potentiometer (control knob) is supplied, and this adjusts the motor speed. The knob can also be replaced by an external signal -- a simple zero-to-five volt input controls the motor speed. These options make our ESC/RevESC family ideal for all manner of non-R/C applications, everything from robotics to low-voltage power tools, buggies, narrow-gauge trains, fairground rides and lab equipment. If you require the VR option, please select VR in the 'Special Options' menu of the Add-to-Basket button. Every application, whether an R/C model or any of the numerous other applications of Dawnmist ESCs, benefits greatly from the performance of Dawnmist's proprietary ESC technology: extremely smooth speed control, excellent torque even at low speeds, high stability, unequalled efficiency (minimising energy wastage and heat generation), safety interlocks, compact size and much more. And all this is available at a very attractive price/performance point. The ESC range is microprocessor-based with quartz crystal timing for superb speed accuracy, and will work with any standard R/C receiver (in place of a servo). The models available encompass three non-reversing models for aircraft use -- ESC-20/30/50, handling up to 20/30/50 Amps respectively -- and two reversible models for car/boat use -- RevESC 20 and 30 (20A and 30A respectively). Additionally, there is a reversible model for low-voltage use (down to 4.8 volts), the RevESC-20-LV. Unlike many competing products, the ESCs are continuously rated for operation at full current, and will tolerate short-term surges (up to 5 seconds) at twice the rated current. The RevESC (reversing) units configure the throttle stick in a 'centre zero' mode, as is usual for reversing ESCs. The foward range covers the full zero to 100% range, while the reverse range is restricted to half speed (0--50%) for better control in reverse -- which is just right for the commoner types of model. For special applications where equal forward and reverse ranges are required, we offer the 'EQ-R' option to special order at no extra cost -- if you require this option, please select EQ-R in the 'Special Options' menu of the Add-to-Basket button. (Please note that on the standard (non-EQ-R) version, the current handling capacity in reverse mode is still the full rated capacity of the unit (e.g. 30 amps for RevESC-30), only the motor speed is halved -- just as if the throttle stick was only moved half as much when in the reverse range; while with the EQ-R option, the forward and reverse ranges are equal). The Dawnmist ESCs also feature a multi-purpose diagnostic LED to assist with trouble-shooting. This indicates safety lockout mode, loss of signal, glitches and motor on/off status at a glance. The ESCs are normally supplied programmed with a linear throttle curve (which can, of course, be modified using either a computer R/C or a Dawnmist Ultimix), but custom throttle curves can also be programmed -- please contact us if you require such a curve. The on-board microprocessor provides fail-safe operation, by continuously monitoring the signal from the receiver. In the event of signal loss or corruption, the motor is brought quickly but not violently to a halt for safety, unlike many other makes of ESCs which will operate unpredictably under these conditions. Additionally, a false-start interlock is provided: upon power-up, the motor is not enabled until the transmitter stick is placed in the STOP position. This feature can avoid potentially dangerous accidents when the system is powered-up with the throttle stick in the wrong position. The Dawnmist ESC range are compact, cool-running and highly reliable solutions to the need for speed control of DC motors up to 1.5kW in rating. For applications where R/C equipment is to be powered from the motor battery, the ESC range are designed to work alongside Dawnmist's HyperBEC range of Battery Eliminator Circuits (BECs). 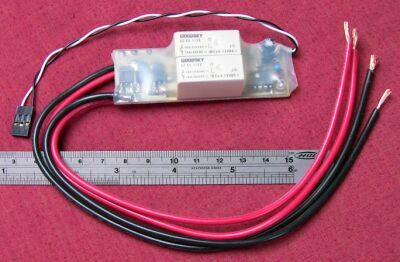 The ESCs are packaged in a shrink-fit plastic sleeve to give a lightweight but fully insulated unit, as depicted above. The ESC-50 alone has a small external heatsink made of brass, which can be seen in the picture. Generously-rated cables are supplied with the ESCs and can be cut to any desired length up to 25cm. Includes delivery anywhere in the United Kingdom by Royal Mail, 2nd class Post. Includes delivery anywhere in the European Union or European Economic Area by Airmail. Includes delivery anywhere in the World by Airmail. 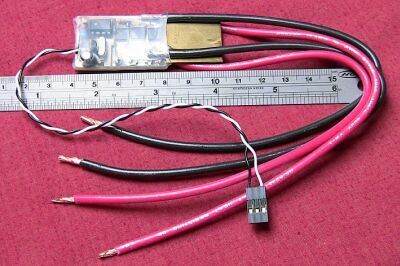 Supply Voltage (ESC): 7.2V min, 30V max. Supply Voltage (RevESC): 8.4V min, 30V max. Supply Voltage (RevESC20LV): 4.8V min, 14V max. If you use a BEC, read this! 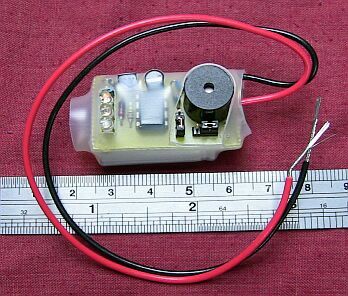 Many R/C modellers today use Battery Eliminator Circuits (BECs) to power their receiver and servos from the same battery as is used to drive the model. For electric-powered models, this makes a great deal of sense -- it removes the need for a separate receiver battery and the attendant need to keep it charged. The theory is that even when the main battery becomes too weak to power the model, the BEC will still supply enough power to operate the R/C equipment properly. But practice does not always live up to theory, and BEC problems are commonplace. The British Model Flying Association warns that "you should not use BEC in an installation where servo battery drain may be high or prolonged, for instance with four or more servos..." . Many experienced modellers will tell horror stories of crashes caused by BEC failures, and a study by Dawnmist has demonstrated that there are still many BECs on the market that are not capable of driving the R/C load claimed. One well-known model sold to helicopter modellers cannot even drive four micro-servos reliably. Some BECs even generate radio glitches, while others cut the power to the R/C while there is still enough power in the main battery to fly -- needless to say, this is disastrous! As a result of these worries, many experienced modellers do not trust BECs, and prefer to use a separate R/C battery. This adds a great deal of weight, and makes it difficult to ensure that the R/C battery is adequately charged throughout a long flying session. The Dawnmist HyperBEC 555 was designed to remedy all these problems once and for all. It uses the latest integrated PNP pass-element technology to provide a generous current (up to 5 Amps continuous, 7 Amps on surges) without compromising the output voltage. Its 'drop-out voltage' is in a class of its own, meaning that the power fed to the R/C will still meet the minimum 4.5 Volts required, even when the main battery is as low as 5.0 Volts and with a full 5 Amp current drain. No other BEC on the market comes close to this specification. The Dawnmist HyperBEC 555 is also robust. Unlike most BECs, it will survive accidental reverse connection to the battery ( and will protect the R/C from damage! ), and withstands output short-circuits. A generously-sized heatsink keeps the BEC cool even under the most demanding conditions. Low-noise linear circuitry avoids any possibility of generating radio glitches, and protects the delicate R/C from conducted noise generated by the motor and speed-controller. 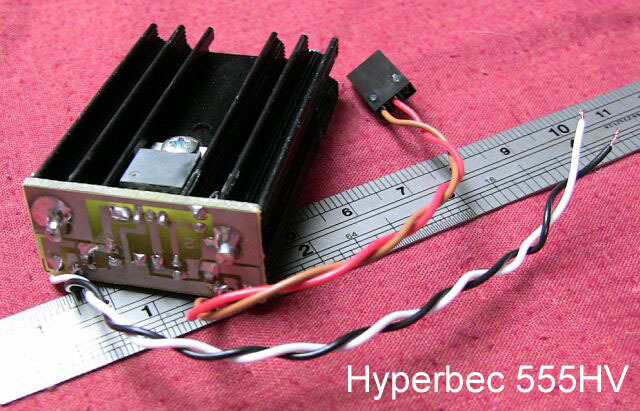 The standard HyperBEC 555, suitable for inputs up to 16 volts, measures just 34 x 28 x 16 mm and weighs around 15 grams -- a remarkable size for such a powerful device. The HyperBEC 555HV is an up-rated version for use up to 27 volts, equipped with a larger heatsink and higher-rated input capacitor but otherwise identical to the standard model. HyperBEC is easy to install, too: two wires for the battery, and two wires to the receiver. A common need is to replace the in-built BEC of a speed-controller with a higher-performance BEC, and with the HyperBEC this is easy. Comprehensive but simple instructions show how to interconnect the R/C, HyperBEC and speed-controller. Any number of parallel cells. Low-battery Performance:	 4.5 V out for 5.0 V in at 5 Amp. Lithium-Ion (LiIon) and Lithium Polymer (LiPo) batteries are set to revolutionize the world of electric-powered models. They offer an unprecedented power-to-weight ratio, offering greatly extended flight times compared with NiCd or NiMH batteries. However, Lithium batteries can be temperamental and have limitations that must be understood. There are two principal sources of trouble: firstly, there's what is known as the Peak Pulse Effect. This is a result of the way that electronic speed controllers (ESCs) work. Instead of presenting a constant load to the battery, an ESC switches very rapidly between full-on and full-off, varying the motor speed by changing the ratio of on-time and off-time. This presents a pulsating load to the battery, and Lithium batteries object to this much more than other types. The result, if the problem is left uncorrected, is that the battery appears to go flat prematurely, but if rested for a minute or two will start providing power once again, just as if the battery were overloaded. The reason is that the battery is sensitive to the peak , not average, load. For example, Lithium Ion batteries are typically rated for 3.5-4.0 C , implying that a 1.4 Ah battery could drive a load of 5 Amps -- but the Peak Pulse Effect means that an ESC drawing 5 Amps (average) will actually be drawing peaks of typically 10 Amps, and these peaks overload the battery. The second limitation of Lithium batteries is that they are easily damaged by over-discharging, and must never be discharged below a specified value (usually 3 Volts per cell, off load). Excessive discharge will permanently ruin the battery. Dawnmist Studio's best-selling Lithimon product family solves these problems and transforms the Lithium battery from a technical curiosity into a trusty workhorse. The compact, lightweight Lithimon unit is simply connected in parallel with the speed controller, and has two functions. Firstly it uses a pair of energy-storage capacitors to 'smooth out' the peaks of the ESC's energy demand -- thus presenting an average, rather than peaked, load to the battery (these are purpose-designed capacitors, since regular 'over-the-counter' types cannot meet the demands of Lithium batteries). Lithimon supplies an extra burst of current to the ESC during the peaks to assist the battery, while recharging in between the peaks. This happens automatically, thousands of times per second. As well as curing the Peak Pulse Effect and allowing the battery to work right up to its full rated current without going flat prematurely, Lithimon also greatly extends the service life of the battery by avoiding overload conditions during every peak, and furthermore, reduces the heat generated in the battery (wasted power). Tests in real models have shown reductions of over 50% in the wasted power, 50% less heat generated in the battery, and up to a doubling of flight duration. Without the Lithimon's energy-smoothing function, the only way to deal with the Peak Pulse Effect would be to use a much bigger battery, negating the principal advantage of Lithium technology -- its light weight. The Lithimon's special energy-storage capacitors yield a pulse impedance below 0.04 Ohms, which means that the Lithimon can provide the battery with assistance at an impressive 25 Amps per volt dropped, making the Lithimon family easily powerful enough for large models while still small and light enough for use on indoor helicopters. The second function of the Lithimon is a sophisticated battery monitor which helps prevent over-discharging of the battery and consequent battery damage. Three ultra-bright LEDs, visible at a distance even in daylight, show the battery status, and an 85 decibel audible 'Land Now!' alarm activates when the battery reaches its limit. The Lithimon 234 covers batteries of 2, 3 or 4 series cells (7.2, 10.8 or 14.4 Volts nominal), while the Lithimon 5678 covers 5, 6, 7 or 8 series cells (18, 21.6, 25.2 or 28.8 Volts nominal) and the Lithimon 9012 covers 9, 10, 11 or 12 series cells (32.4, 36, 39.6 or 43.2 Volts nominal). All versions offer three selectable discharge responses for moderate, heavy or very heavy current drain applications. An on-board microprocessor uses a sophisticated measurement technique (10-bit ADC with 64x oversampling and a specially-developed DSP algorithm) to obtain an accurate, stable battery level measurement -- despite the peaks and surges from the ESC and motors, which would defeat a simple voltage monitor. The Lithimon 234, 5678 and 9012 can pay for themselves many times over by preventing damaged batteries and by allowing Lithium batteries to be used to their full capacity without the ravages of the Peak Pulse Effect. Technical Report -- Click here for proof that Lithimon really works! All three units can handle any number of parallel cells. Computer functions on basic R/C! Many modellers are attracted by the facilities of micro-computer R/C systems (particularly the mixing and failsafe functions) but put off by the price. UltiMix upgrades a standard R/C to computer-R/C functionality and beyond for a fraction of the cost by putting a micro-miniature, but fully-featured, computer system aboard the model itself. This novel solution is made possible by the very latest microprocessor technology, which has allowed us to pack previously-unimaginable levels of computing power and on-board software into a package weighing just 17 grams, complete with the controls needed for programming and setup. And despite its power and flexibility, it's very easy to set up and use. UltiMix is built for reliability, using design techniques drawn from aerospace research. UltiMix combines a range of mixing, scaling and failsafe functions, and is entirely user-configurable. It is ideally suited for helicopters -- a helicopter that would normally require a 5-channel computer R/C can be flown from a standard 4-channel set using our Collective and Tail mixing functions (CPM or CCPM programs, supporting 90 or 120 degree swashplates), or it can replace the clumsy and inaccurate mechanical mixers used on some helicopters. Varying degrees of 'Exponential' may also be selected for easier cyclic control. An additional feature is provided by the ability to connect the gyro between the Rx and UltiMix, in effect making the tail-pitch mixing take place after the gyro correction, and thus preventing the gyro from trying to fight against that change. This option, which is not possible on computer R/C systems which perform the tail mixing at the transmitter, can make a tremendous improvement to the helicopter's performance, especially with heading-lock gyros -- this is of great benefit whether you're a beginner or a 3D champion! UltiMix is equally at home in an aeroplane, where it can support control configurations including V-Tail and Elevons (combined elevator/ailerons, used on delta-wing models especially), or may just be used as a failsafe and/or exponential control in a standard airframe. Ultimix also supports differential steering, as used on tracked vehicles (tanks) and some water craft. Additionally, UltiMix can be programmed to reverse, 'scale' and/or offset (trim) different channels, functions often lacking at the transmitter but extremely useful for ease of mechanical setup. Even if your model doesn't need the mixing functions, the powerful exponential control, failsafe and easy adjustment facilities make the UltiMix 5000 a very worthwhile performance-enhancing addition to any R/C model. UltiMix has four servo inputs from the receiver and/or gyro, and drives up to five servos (the 5th output allows Throttle/Collective tracking in helicopters). For R/C systems with more than 4 channels, the additional channels simply drive servos directly, independent of the UltiMix. All channels passing through the UltiMix, even if the unit is not programmed to change them in any way, are subject to failsafe operation. The UltiMix constantly examines the input signals from the receiver to verify that radio reception is OK, and detects glitches, interference and loss of signal. When such an event occurs, the unit will hold the controls in the last valid position for a selectable length of time, and then adopt user-programmed 'failsafe' positions. Typically, the time interval might be set for a second or so, to prevent momentary glitches from changing the flight path, while ensuring that the aircraft is quickly put into a safe configuration if signal is lost. All failsafe actions are totally user-programmable, so that the most appropriate failsafe behaviour for your model may be chosen. The failsafe action alone can easily pay for itself by avoiding damaging crashes, and could even save a life. A failsafe unit is required by law on larger models, and is a very worthwhile addition to any model. The UltiMix is a worthwhile investment for its failsafe function alone, let alone the mixing and exponential functions. Correctly used, exponential control can make a model very much more controllable, both adding to your enjoyment of the hobby and reducing the risk of crashes. The UltiMix can store five user-defined programs, so the unit can be moved from model to model along with the Tx and Rx, if desired. This means that once all the details for a given model are stored in the unit's memory, they can be recalled at the touch of a button -- just like a computer R/C. Four miniature buttons are used for programming the unit, which also has five multicoloured LEDs to indicate status. The unit does not require an external power source, deriving the very small amount of power it requires to operate from the receiver battery. Use of special non-volatile memory means that stored programs remain intact indefinitely, without a battery -- so there's no risk of the unit 'forgetting' your programming. Our products are backed up with a comprehensive e-mail technical support service, and we have a policy of continuous product improvement, responsive to customers' requests and suggestions. UltiMix is designed so that its internal software can be upgraded by us for a nominal handling charge, so you can take advantage of future additions to the functionality of the unit. Details of latest version numbers, new features and how to upgrade are posted here. When you compare the cost of the UltiMix with that of upgrading to a full computer-controlled R/C system, you will see that it represents excellent value for money. It is much less expensive to purchase a basic R/C and an UltiMix than to purchase a microcomputer R/C; not only that, but the UltiMix offers much superior functionality to many microcomputer R/C's. UltiMix Upgrades Available -- Click Here! The Throttle Minder from Dawnmist Studio is an economical, simple-to-use failsafe system for radio controlled models such as boats and cars. It is based upon the very sophisticated technology of Dawnmist Studio's successful UltiMix 5000, but trimmed down to just a single-channel failsafe and optional voltage monitor, and available for a fraction of the price of the UltiMix. Throttle Minder's advanced microprocessor technology provides the modeller with industry-leading protection and peace of mind at a very attractive price. While UltiMix caters particularly to the high-end of model aircraft applications, many modellers have felt a need for a much simpler device that is sufficient to bring a non-flying model (e.g. car or boat) to a safe halt in the event of R/C malfunction, signal loss or battery weakness. Throttle Minder addresses this niche perfectly. Throttle Minder is available in two models: the basic model, Throttle Minder 100 , provides the ability to detect a loss or corruption of the radio control signal and gives an immediate response by moving the throttle servo (or electronic speed controller) to a pre-designated 'safe' position in order to bring the model to a safe stop, thus avoiding possible damage or injury. The more advanced Throttle Minder 200 , although no larger than the -100, provides all of the features of the -100 plus a battery voltage monitor and 'brown-out detector'. This provides a second safety feature: should the receiver's power supply drop low enough (due to a flat battery or faulty Battery Eliminator Circuit) to jeopardise proper operation of the receiver, the unit will also switch the throttle to the 'safe' position. Throttle Minder is user-configurable: when first installed in a model, it's a simple matter to program in your chosen 'safe' servo position, and (for the -200 model) equally simple to adjust the voltage at which the battery alarm trips (if the factory-set level is not suitable). Once 'taught', the unit retains this information, even in the absence of power, using a special memory. You can re-program the unit as many times as you like, so you can even move it from model to model. Throttle Minder is very simple to install. 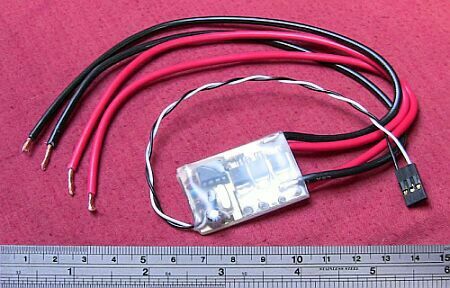 It consists of a tiny, lightweight unit which connects in between the Receiver (Rx) and throttle servo (or speed controller) -- just one input and one output lead. The unit has a daylight-visible LED to show when a failsafe condition occurs, and a miniature push-button which is used for 'teaching' the unit. Setting-up takes only moments when installing the Throttle Minder; after that, your configuration is remembered indefinitely. Needless to say, it requires a fair amount of computing power to continuously monitor a radio control signal for signs of glitches, interference or faults. 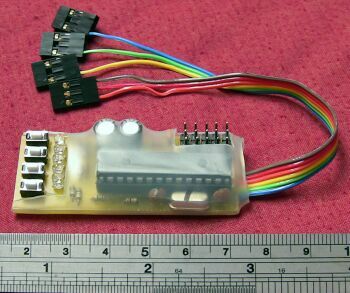 Despite its tiny size and low price, the Dawnmist Throttle Minder contains a 20 MHz RISC microcomputer and sophisticated software. Advanced DSP software techniques enable it to reliably detect interference that could escape the attention of a less sophisticated failsafe unit and lead to a crash. All Dawnmist R/C products are backed up with an Internet-based technical support service and a full warranty, and come with comprehensive instructions. The low price of the Throttle Minder makes it a very wise investment -- it can pay for itself many times over the very first time it averts a crash. How often have you been cursed with a servo that rotates the wrong way? Or needed a pair of servos that turn in opposite directions? The ReverSafe 100 from Dawnmist Studio is an economical, simple-to-use single servo reverser for radio controlled models such as aircraft, boats and cars, which also features a built-in failsafe device. It is closely related to Dawnmist Studio's successful Throttle Minder 100, but with an added reverser function. Even if your application does not demand a failsafe, the ReverSafe 100 provides a simple cure for wrong-way-round servos at a very attractive price. For more complicated setups requiring more than a single-channel reverse and failsafe unit, we also manufacture the very sophisticated Ultimix 5000, which offers 4/5 channel operation and adds all the features of the best microcomputer R/C systems to any 'conventional' R/C. UltiMix 5000 provides total user programmability and a wide range of failsafe, reversal, mixing and exponential options, making it ideal for high-end aircraft/helicopter applications. ReverSafe 100 provides an inexpensive solution when only basic reversal/failsafe features are required. ReverSafe 100 takes one input from a receiver and drives one servo. The signal output to the servo is the exact reverse of the input signal, so as to reverse the direction of rotation of the servo but not its angle of movement. This provides a simple cure for a problem that might otherwise require a complicated reversing mechanical linkage, or a solution when opposed pairs of servos are required. In the latter case, which is often found in aileron systems, the relevant receiver output drives one servo directly and, by means of a 'Y-cable', drives the opposed servo via the ReverSafe. The principal purpose of the ReverSafe 100 is of course reversing a servo, though a simple failsafe is included at no extra cost. This provides for the detection of loss or corruption of the R/C signal, and when this occurs, moves the servo to a user-defined position. ReverSafe 100 is user-configurable: when first installed in a model, it's a simple matter to program in your chosen 'safe' servo position. Once 'taught', the unit retains this information, even in the absence of power, using a special memory. You can re-program the unit as many times as you like, so you can even move it from model to model. ReverSafe 100 is very simple to install. 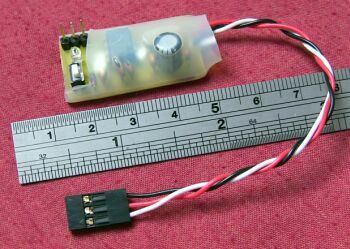 It consists of a tiny, lightweight unit which connects in between the Receiver (Rx) and the relevant servo -- just one input and one output lead. The unit has a daylight-visible LED to show when a failsafe condition occurs, and a miniature push-button which is used for 'teaching' the unit. Setting-up takes only moments when installing the unit; after that, your configuration is remembered indefinitely. All Dawnmist R/C products are backed up with an Internet-based technical support service and a full warranty, and come with comprehensive instructions. The low price of the ReverSafe 100 makes it an unbeatable solution to the age-old problem of the 'wrong-way-round servo'. Are you a Dealer, Reseller or Retailer? If so, please contact our sales desk for details of reseller (trade) pricing and quantity discounts, marketing/promotional support and other benefits available to Authorised Resellers of Dawnmist products. sales@dawnmist.org. ; for technical enquiries and product technical support please email tech@dawnmist.org..